While we've had a chance to put Samsung's upcoming flagship Tab 10.1 tablet through 3 weeks of rigorous testing, there was one thing left that we could not touch - the custom TouchWiz UX tablet interface, also known as TouchWiz 4.0. If you remember, Samsung announced last week that the first tablet units would be running pure Honeycomb, just like our review unit, with the TouchWiz upgrade arriving over-the-air sometime after. This didn't stop Phone Arena from acquiring some Tab 8.9 hardware with TouchWiz UX already pre-installed and digging through it, looking for goodies Samsung packaged with their soon-to-come overlay. We've already seen some of them during the CTIA keynote, but Phone Arena goes into some more detail and shows us some things we didn't see during the announcement. Those of you who have experience with custom overlays, and TouchWiz specifically, might be cringing this very moment, but in my opinion, it's quite possible that Samsung managed to avoid screwing up this time. Of course, real-life testing when the tablets are released may disprove this claim, but so far I don't see any negative additions (like the overly colorful and foreign to Android app launcher on the regular TouchWiz). This might just hold us over until the custom ROM community gets a hold of the Ice Cream Sandwich code later this year and flexes its muscle before truly unleashing an array of customizations you couldn't even dream about right now. A nice control bar full of useful toggles right in the notification area - hallelujah! A brightness slider also in the notification area without requiring that extra click - this is the feature I use the most, so I'm quite excited about it as well. 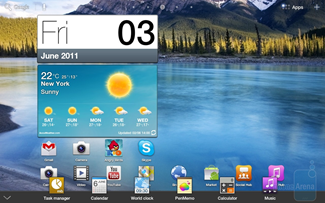 A Mini Apps Tray that can be pulled up at any time by swiping up from the bottom of the screen. It seems like it only contains a bunch of mini-apps, and it's not clear whether they could be changed to regular app shortcuts. It's most definitely a very useful feature, if Samsung doesn't screw it up by locking down which apps can be launched. 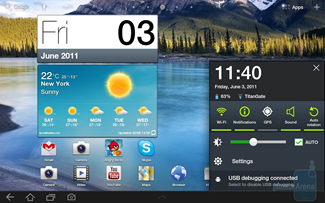 Live Panels that let you resize widgets (though Android 3.1 already has that). 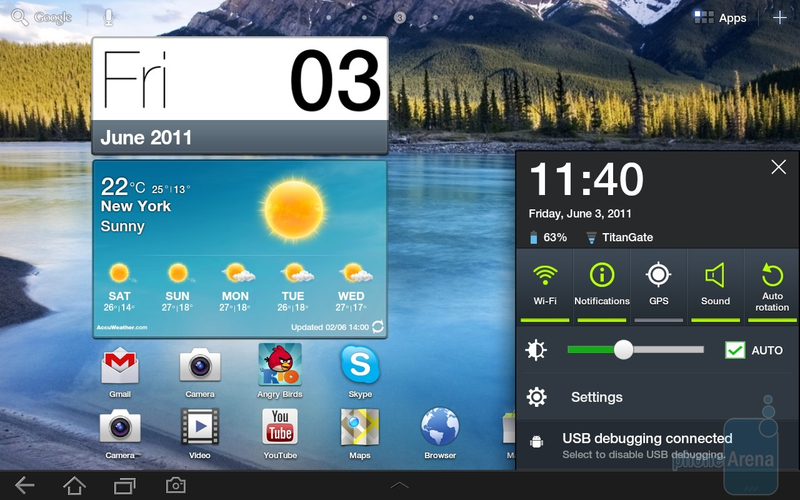 The same widgets as on the Galaxy S2 (weather, date/time, etc, which are frankly pretty ugly). So there you have it - the TouchWiz UX, oddly lacking bloat and crapware, leaving me with a strange sense of hope. I'm not sure whether the final version will have more features or we've already seen everything, but at this point I'm no longer dreading the day when the OTA icon shows up on my Tab.